The power of marketing has obscured the original symbolism of the Olympic torch as an effective celebration of human rights violation. 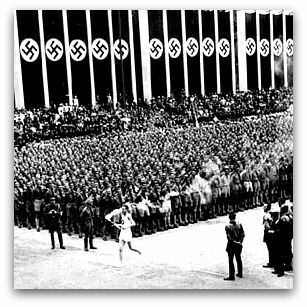 The modern Olympic torch relay was initiated by the organisers of the 1936 Berlin Olympics. It was carefully orchestrated by the Nazi leadership to uphold the image of the Third Reich as a dynamic and expanding influence on the international culture and economy. It fitted perfectly with the Nazi belief that classical Greece was an Aryan forerunner of the modern German Reich. Olympic officialdom has since cast aside the torch's original link with political oppression and human rights violation by asserting that it's about sport, not politics, and that the two are mutually exclusive. 2008 is not the first occasion on which protestors have attempted to expose the flame's link to human oppression. Before the 1956 Melbourne Olympics, a veterinary science student at St John's College at the University of Sydney was successful in upstaging the torch with a fake flame that rose from kerosene-saturated underwear, before Sydney Lord Mayor Pat Hills. Prankster Barry Larkin and fellow students organised the action because of the torch's Nazi origins, and the fact that it was given 'too much reverence'. Last week, Fr Shay Cullen wrote that the Relay is 'a very political gesture' first used by the Nazis to 'justify their self-proclaimed superiority over others'. Cullen is a Columban missionary in the Philippines who has been shortlisted three times for the Nobel Peace Prize. He was writing in the context of the 'unarmed saffron robed monks kicked, clubbed, beaten, tortured, imprisoned and killed in Tibet simply because they want religious freedom and dignity'. He suggested that we should all 'take a good look at ourselves and our beliefs'. From his own experience in the Philippines, he has come to the conclusion that the United Nations is a 'toothless organisation with no power to change anything or stop the pain of those being tortured and abused'. Michael Mullins is editor of Eureka Street. He also teaches in the Media and Communications Department at the University of Sydney. Totalitarian regimes and societies have almost always encouraged sport, and Jeff Kennett's heavy-handed rightist government made sport compulsory in Victorian schools. The link between sport and control freaks has been apparent to me for 50 years. Kind regards, N.S. Shay Cullen's life and insights remind us that Christians ought not join in the 'blame game' by ranting about the failure of governments while we still have our hands out for any monetary sop.